Bike Walk Lincoln Park: What's in store for Lincoln Park under the Streets for Cycling 2020 Plan? 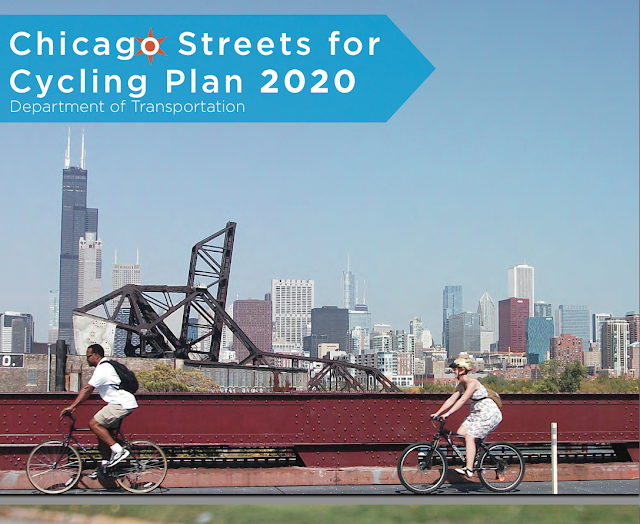 What's in store for Lincoln Park under the Streets for Cycling 2020 Plan? The visually exciting news of last week was the opening of the Loop's first two-way protected bike lane on Dearborn Street, of course. Who can resist the sight of our mayor high-fiving smiling bicyclists? Well not me, that's for sure. Please download the plan and read it (link directly to PDF here)! Don't rely on this flimsy blog entry to summarize for you; there's just too much there. It's a beautifully done 57-page document that takes you through the process of putting together the plan, and then describes the recommendations for each area of the city. There's also an appendix with illustrations of various bike lane types, which can be used by communities when working out the hard details of how to make this work for everyone in the neighborhood. And it will take a lot more work! We're looking forward to working with Alderman Michele Smith and all stakeholders to make these upgrades over time in a way that earns broad community support. OK, let's talk about our neighborhood. Below is the map of Lincoln Park and very nearby areas, as seen in the Streets for Cycling 2020 Plan. 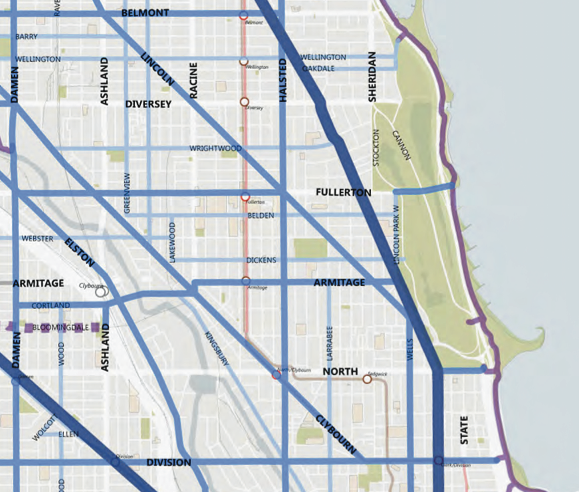 The dark blue line on Clark Street means it's a Spoke Route, and the heavy medium-blue lines on Armitage, Halsted and others means it's a Crosstown Route. This means they're long arterial streets that will get the highest level of bike lanes possible, given constraints like width of the roadway, existing parking issues, and other factors. The lighter blue lines are proposed Neighborhood Greenways, which are quiet side streets that will be given certain features to help make them even more calm and safe for riding a bike. When you look at the map below, it looks like a pretty dense network. However, keep in mind that 1/ it's an eight-year timeline, and 2/ nothing is guaranteed. So, what I found really interesting and somewhat encouraging about the final plan were the lists of specific street segments according to the proposed timeline of completion between now and May 2015, which will mark the end of Mayor Emanuel's first term. 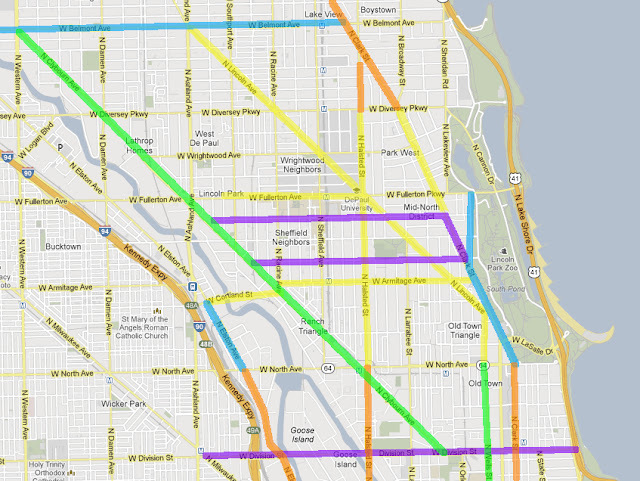 So, the more immediate question is: What's in store for Lincoln Park and nearby areas over the next 2.5 years in terms of better bicycle infrastructure? I enlisted the help of Anneliese Stenzel, eighth grader and graphics pro, to map it out for us. This is a map of the upgrades that have already been installed, in Lincoln Park and nearby. As I've said before, buffered lanes are slightly better than conventional bike lanes because of the small amount of extra room, but they do nothing to prevent drivers from swerving into them, driving on them, or blocking on them by standing or double parking on them. So it's good news for people working, shopping, walking and biking on Clybourn. I wrote my impressions about how that street needs major help on this post. It remains to be seen whether we'll see protected bike lanes or merely buffered lanes there. The other green line is on Wells, and I can pretty much guarantee that it will be buffered lanes there through Old Town, due to the narrow street width. Next are the blue lines, which show the streets slated for upgrades between May 2013 and May 2014. I'm most excited about the section on Clark between North Avenue and Armitage. We've been pointing out how the current four-lane design is treacherous for pedestrians and bicyclists alike, and detrimental to the overall life of the street. We can do so much better than that. We're confident that we'll get the support from stakeholders to put in protected bike lanes, pedestrian refuge islands, and other improvements. The small segment of Lincoln Park West from Armitage to Fullerton will likely be more of a Neighborhood Greenway. The Elston Avenue protected bike lane currently goes to North Avenue, but by May 2014, it should reach all the way to Cortland, which will be a nice way to connect to get to Armitage and Lincoln Park to the east, or the quiet streets of Bucktown on the west. And in the final one year, from May 2014 to May 2015, the purple streets seen on this map will receive some attention. In our ward, these are primarily Belden and Dickens, which will serve as a nice way to traverse the neighborhood from the far western parts of Lincoln Park to the eastern portion. Just south of our ward, Division Street is scheduled for an upgrade, and given its generous width, especially west of Wells, I'm holding out hope for a protected bike lane for Division. It would be great to have a way for people in the Gold Coast to ride their bikes safely to the library near Sedgwick, or to the Ukrainian Village area at Milwaukee, to check out a fun new restaurant or coffee shop. So that's it! Although the colors make for a pretty map (thanks, Anneliese! ), even after 2.5 years, it's still going to be a little disjointed. But keep in mind that there are existing lanes already present, and we're going to keep up the pressure to restripe those lanes, especially if they will be getting no other TLC for three or more years. Therefore, we made one last map, which overlays in yellow lines the existing bike lanes, most of which are the conventional single stripe to the left of parked cars, with small segments being just "shared lanes". When you look at this map, with all the upgrades as well as the current lanes, it makes a little more sense. My overall impression? Well, of course I think it's not enough, and not soon enough! But I recognize it's a multi-year plan, and that we're just one little part of a big city, and it's a good start. However, I will say I'm still thinking that a very, very good protected east-west route is very much needed sooner than later on an arterial, and Armitage would be a great way to link Bucktown and the Bloomingdale Trail with our Armitage Avenue retail district and parts to the east. But that can be the subject of its own post. What do you think about the Streets for Cycling 2020 Plan in general? Or about our Lincoln Park portion? Comments below, please, or tweet to @BikeWalkLP! What I find concerning about the Streets for Cycling Plan is that CDOT is now classifying buffered lanes under the "protected lanes" category and has begun to call them "buffer protected lanes." I don't know about you, but I would hardly consider buffered lanes to offer any form of true protection. It's rather misleading when CDOT says that they're going to build 100 miles of protected bike lanes and then suddenly claim that buffered lanes are part of that count. Our suggested bike share station locations!